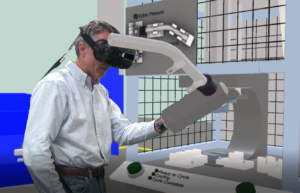 Emulate3D is on booth 121802 and will be featuring our new Emulate3D for Machine Builders product, as well as an interactive virtual machine prototype. You will be invited to experience the prototype via an in-VR browser-based HMI, buttons, and levers. Watch the video here. We’ll also offer you a free seat at an online workshop (usual price $299) so you can try out the technology for yourself after an instructor-led introductory course. 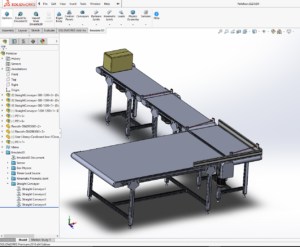 Emulate3D for Machine Builders helps you create fully operational controls testing models of a wide range of machine types, directly within SOLIDWORKS. Debug and refine the kinematic sequences and timing of your designs in a virtual environment, and make changes to them faster than is possible with physical prototypes. Watch the video here. 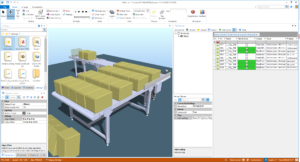 Create your machine or mechanical system in CAD, mark up the various kinematic and control elements, add a load source if the operation is triggered by the presence of products, then connect the control and activation elements to the PLC IO, and run the emulation model. 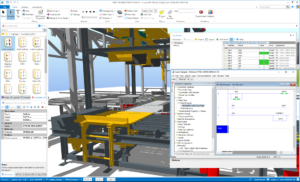 By combining your mechanical CAD information with the real control system logic you can create a valuable test bed in the form of a Dynamic Digital Twin. View and verify the system operation and control logic before you commit expenditure to building the real system. Use the controls HMI to train operators offline in a safe and repeatable environment, while eliminating disruption to running operations. Create system failures that would be costly or dangerous in the real world, and develop start up and recovery sequences that would be problematic outside the virtual environment. For further information please contact Rob Morrow on 801-923-3316 or rob.morrow@demo3d.com and visit our website https://www.demo3d.com/.